Elizabeth Warren, at her Somerville headquarters Thursday, e-mailed supporters to explain her handling of ancestry questions. A day after Elizabeth Warren acknowledged that she told two Ivy League schools she was Native American, her campaign began scrambling to allay the concerns of supporters about her handling of the issue, while political observers questioned why she’d let the incendiary issue smolder for so long. 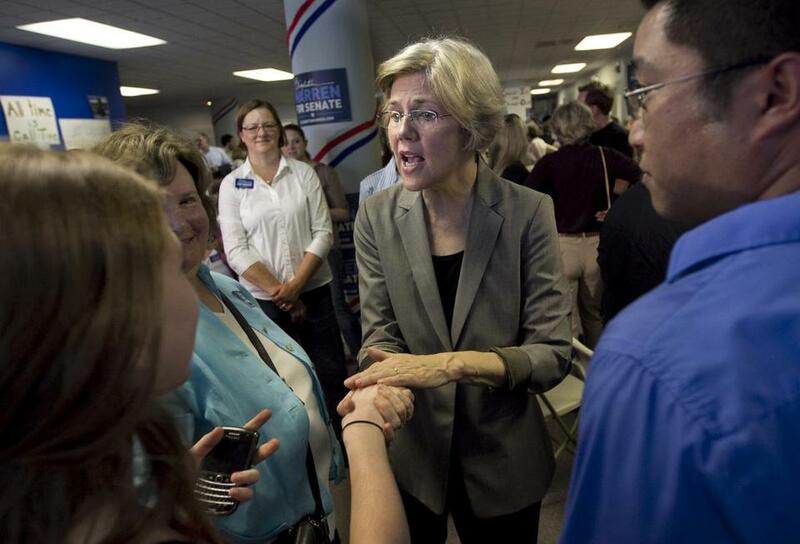 A senior staffer on the campaign, meanwhile, said the Warren team was not even aware that she’d been listed as Native American in any official capacity before the news broke last month, because researchers hired to scrub their own candidate’s background for biographical details that might erupt had failed to unearth that the law professor began identifying herself as a Native American about 25 years ago. In an e-mail to supporters on Thursday, Warren sought to explain why she couldn’t back up claims that she is a Native American with proof of ancestry - a federal requirement when universities report their diversity data - and tried to rally her base by characterizing the backlash as a Republican-fueled personal attack. As the candidates squabbled, a handful of Democratic party leaders spoke of growing concerns within the ranks that the issue could shake Warren’s strong support less than 48 hours before Saturday’s Massachusetts Democratic nominating convention in Springfield - an event that the party has seen as a highlight of the election season for Warren. The constant drumbeat of questioning and growing skepticism of the political press corps has haunted Warren for more than a month, since it was first reported that Harvard touted her as Native American in comments to its student newspaper. Political observers said Thursday that the Warren campaign seemed to be ducking the topic in the hopes that it would go away - flouting the campaign tradition of quickly addressing a difficult issue to contain it. National Democratic strategists offered similarly unvarnished assessments. Warren’s team was caught flat-footed by the assertions first raised in the Boston Herald on April 27 that Harvard described her as a minority years ago. The candidate said she only learned of the claim when she read it in the newspaper. Days of fumbling turned into weeks, finally leading to Warren’s revelation Wednesday night to the Globe that she had personally reported herself as a Native American to the Ivy League law schools where she worked, the University of Pennsylvania and Harvard University. The Democratic strategists who thought that the Warren campaign bungled the issue attributed the mishandling in part to the fact that she is an untested candidate. The most important strategy going forward, the strategists said, is to prevent any further surprises. “If there is anything else that isn’t public knowledge, it needs to be all out there in the next 48 hours. If there are more headlines and new aspects to this story over the summer, then it never goes away,’’ said Dan Schnur, director of the Jesse M. Unruh Institute of Politics at the University of Southern California, who worked on John McCain’s 2000 presidential bid. Schnur contrasted the Warren controversy with the handling of a story during McCain’s 2000 presidential run , when the Globe reported that the Arizona Senator - who had denounced special-interest money - had written letters to the Federal Communications Commission on behalf of a communication company that helped him raise campaign money and let him use its corporate jet. Warren, by contrast, has faced a month’s worth of difficult press. Still, some Democrats argue that the Harvard professor has not been hurt by her campaign’s delay in addressing the issue head-on. Recent polls show that Warren has not lost ground with voters since the controversy took root. In fact, Brown’s lead has narrowed in recent months. “This is a hothouse media story that by every indication from the polls has had absolutely zero impact on the race,’’ said veteran Democratic strategist Bob Shrum. Noah Bierman, Michael Levenson, Frank Phillips, and Sarah Schweitzer of the Globe staff contributed to this article. Stephanie Ebbert can be reached at Ebbert@globe.com. Follow her on Twitter @StephanieEbbert.